The University of Toledo's LaunchPad Incubation Program hosts Hackathon. The University of Toledo’s LaunchPad Incubation Program has been selected as the March Incubator of the Month by the International Business Innovation Association. This puts the program in the running for Incubator of the Year, a prestigious honor held by very few incubators across the globe. UT’s LaunchPad was selected for the monthly honor based on a longitudinal study by the U.S. Economic Development Administration and the International Business Innovation Association, which is a global nonprofit that has supported entrepreneurial organizations for more 30 years. Their study assessed the incubators’ services, economic outcome, and the number of companies graduated. One of the most frequent issues would-be entrepreneurs ponder is at what point they should take the step of registering their business, a question that was raised Thursday at a UT event for start-up businesses. Launchpad Incubation staff featured in Toledo City Paper. Why you should know him: Jordan Valdiviez is a self-described “conduit,” connecting people with ideas to resources and like minds. As operations manager at the University of Toledo’s Launchpad Incubator, he also acts as a translator for businesses and the tech industry. UT’s Launchpad Incubator is a gem in the local tech community. One of the incubator’s biggest events, the annual Pitch and Pour, invites businesses and individuals to pitch their idea to investors, Silicon-Valley style. Valdiviez helped organize the Pitch and Pour event (he was sure to give credit to Incubator director Jessica Sattler), but his day-to-day is mostly spent as the communications point between businesses in the Toledo area who need something Valdiviez knows how to get. 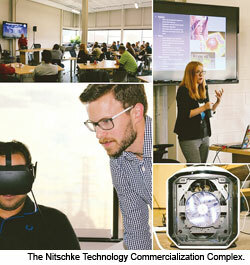 TNewTech is a meetup in Toledo that highlights up-and-coming technology and promotes innovation in Northwestern Ohio. They recently hosted an event—focused on AI, machine learning, and data science. And, they invited Nexosis up to tell them what we've been working on. The University of Toledo’s annual business start-up, called the Pitch & Pour, took place on Thursday night. Now one company is closer to becoming a reality. Five teams brought their business ideas before investors and professors, while local breweries showcased their craft beer. The 'Shark Tank' style competition has 10-thousand dollars on the line to help move one of the businesses forward. Ideas included an app that combines social media message into one, as well as 3-D printed bone implants, and a treatment for autism. The event was sponsored by UT’s Toledo LaunchPad Incubation Program, which helps business ventures move from concept to commercialization, and by NextTech, a new entrepreneurial services provider that grew out of a partnership among ProMedica, Mercy Health, UT, and Bowling Green State University and aims to help entrepreneurs in 18 northwest Ohio counties. TOLEDO, OH (WTOL) - Alicia Wagner has a business concept and she needs some seed money to get it off the ground. It’s called PUDL. it's an app where you can send your messages from different platforms and put them in one place. “We’re projecting in 2020 there will be 2.9 billion users of social media and there’s currently not an application like this in the market,” Wagner said. She participated Thursday night in ‘Pitch and Pour’ sponsored by the University of Toledo LaunchPad Incubation Program. TOLEDO (13abc Action News) - A University of Toledo graduate is back in town tonight after landing a big deal on the ABC show Shark Tank Tom Burden is here to help judge a competition he won a few years ago, Pitch & Pour at The University of Toledo. Tom made a huge splash on Shark Tank. In fact, it was a feeding frenzy for his product as all five sharks made offers to invest in his invention. His interest in the show was sparked by a friendship with a neighbor, and we caught up with both of them today. The pilot and inventor sparked a shark feeding frenzy on Shark Tank. TOLEDO, Ohio (13abc Action News) - Tom Burden had all the sharks circling to get a piece of his product when he appeared on the hit ABC show Shark Tank on Sunday. He is also a member of the Air National Guard's 180th Fighter Wing in Swanton. Tom is a weapons mechanic on fighter jets, and it's his work with planes that started the idea for his product. He started by building prototypes of the Grypmat at home. Several years later he has has three big-time entrepreneurs helping grow his business. It's all a dream come true for a young man from the small Ohio farming community of Celina. Tom had a well-delivered pitch for his product, "We've sold 10,000 units, and we've had about $400,000 in sales so far." Kristi Hoffman talks to mother-daughter team Billie Johnson and Rhonda Sewell, visits the~Launch Pad Incubator at the University of Toledo, and takes a look at the Flex Scoring Catheter developed locally by VentureMed Group. OsteoNovus Inc., a biomedical startup that this week received federal regulatory approval for a new synthetic bone-graft material, is closing in on a deal that would jump- start sales and likely push the company to profitability before the end of the year. For a firm that has not yet even hired sales staff, that’s a good start. Four teams were given five minutes to pitch their business models to three judges. The teams compete for $10,000 in cash and prizes to launch their company.“I feel like this is a platform to get technology out there. Receive feedback, receive funds that you need to move it forward,” said Jessica Sattler of the Incubation Program.The mission of UT’s Incubation Program is to promote economic development in northwest Ohio through innovation and technology.The winner of the 2016 Pitch and Pour 5.0 was Zid-Zid, a web based platform, designed for kids ages three to six, which helps parents expose them to world languages. A biomaterial that grows strong bone in six weeks is just one of the high-tech products being produced at the LaunchPad Incubation Program at the University of Toledo. Other innovative products being developed in the incubation program include semitransparent, flexible, thin-film photovoltaic coatings that convert sunlight to electricity; a broadcast studio powered by cloud computing; satellite imagery processed with algorithms to provide information on the world’s land and water resources; new bio-based specialty chemicals and polymers that do not rely on plant sugars used for human consumption; and photoelectrochemical systems that can generate hydrogen, using renewable energy sources. A University of Toledo research professor is quietly seeking investments to commercialize a device that he says can accurately identify pathogens in a matter of minutes, potentially transforming food safety and the very way illnesses are diagnosed. Dr. Anand Agarwal, a surgeon and professor of bioengineering at UT, said the development is revolutionary. “It is combining electronic hardware, software, [and] chemistry to come up with a device which can identify a bug within five minutes,” he said. The palm-size prototype looks similar to a diabetic test strip reader. bioengineers are officially in the business of back pain relief. A new medical device developed by researchers at The University of Toledo to help reduce infections from spinal surgery is making its market debut. Spinal Balance created Libra, a pre-sterilized, individually packaged screw system designed to combat contamination in the operating room. Spinal Balance will celebrate the launch of its first locally grown product called the Libra Pedicle Screw System Wednesday, May 25, at 6 p.m. at the Nitschke Technology Commercialization Complex on UT’s Main Campus. OsteoNovus, a startup company that is regenerating bones through a unique technology developed at the University of Toledo, is benefiting from two Technology Validation and Start-up Fund grants from the Ohio Third Frontier commission. The commission awarded OsteoNovus $100,000 last October following an original grant of $250,000. The firm has raised a total of $1.5 million from Ohio Third Frontier partners such as UT’s Rocket Innovations and other investors, according to Anand Agarwal, co-founder, president and CEO. OsteoNovus is an early-stage, orthopedic medical device company focused on the development of biologic materials to support and regenerate bone. OsteoNovus regenerates bone through a unique technology developed at the University of Toledo. The company has benefitted from two Technology Validation and Start-up Fund grants from the Ohio Third Frontier. OsteoNovus also received early funding and support from Ohio Third Frontier partners Rocket Ventures and LaunchPad Incubation, where the company is a tenant. It’s often said that free advice is worth exactly what it costs. Then again, free advice usually doesn’t come from NASA scientists. A handful of engineers and scientists from NASA Glenn Research Center in Cleveland came to Toledo as part of the space agency’s new NASA Roadshow initiative. The space agency’‍s employees go on the road and offer expertise to businesses that find themselves stuck on engineering or technological problems. The program is a spinoff of the White House’‍s Strong Cities, Strong Communities Initiative and an effort to help get the fruits of publicly funded research into the hands of local businesses, which can help create new jobs. A Toledo technology start-up firm has been chosen to take part in a prestigious Silicon Valley mentorship program that has helped nurture some of the tech industry’s bigger success stories. “It’s hard to imagine this kind of opportunity for a start-up. You cannot buy this opportunity. Each day is like a month’s worth of learning,” said Toledoan Tim Varner, one of Roost’s three co-founders. In business parlance, Y Combinator is a “seed accelerator.” Y Combinator brings start-up owners and staff to its Silicon Valley headquarters, where Y Combinator puts them through a three-month boot camp with a focus on determining the best use for their products and growing their companies. A software company that relocated from Seattle to the LaunchPad Incubation Program at The University of Toledo and has since received grant funding from LaunchPad Incubation, UT Innovation Enterprises and Rocket Ventures has been selected to participate in Y Combinator, a prestigious accelerator in Mountain View, Calif.
Roost, which has developed push notification software for desktop platforms, will participate in the three-month accelerator program this summer in Silicon Valley. The winners of the third annual UT Innovation Enterprises Challenge Business Plan Competition were announced last week in the PNC Entreprenuership Lab in the Savage & Associates Complex for Business Learning and Engagement in the College of Business and Innovation. “We congratulate all 26 entrants for the extremely high-quality proposals they submitted,” said Richard Stansley Jr. of UT Innovation Enterprises. “These technologically innovative ideas clearly demonstrate creative thinking within the UT campus, which is exactly what this competition strives to foster. It sure didn't seem like the kind of day to be checking out a solar panel array as officials led the way to the roof of the General Motors Toledo Transmission Plant on Alexis Road. The sky was gray, the air was chilly, and the sun was nowhere to be seen. "They're producing power, believe it or not," Granger Souder said, even as a light rain fell Thursday. "That's one of the reasons we went to First Solar [panels]; they're good in these lighting conditions and good flat." Laid out before Mr. Souder was an 80,000-square-foot blanket of black panels owned and installed by his company, Solscient Energy. A refinery that could make diesel fuel from such organic matter as rice hulls, wooden demolition debris, or even treated sewage sludge moved a step closer toward construction Thursday when the Toledo-Lucas County Port Authority approved a 40-year lease for an East Toledo industrial site. Synterra Energy, Inc., a joint venture of locally based Red Lion Bio-Energy LLC and Pacific Renewable Fuels and Chemicals of California, still must obtain several permits from the city of Toledo and state of Ohio before it can build the plant on nine acres of the former Toledo Coke property on Front Street. Click here to continue reading.